Innova IRM2000 is a sleek and modern rowing machine by Innova Health and Fitness, which is a fitness equipment company and a well known brand for a range of inversion tables. It is rated 5 out of 5 stars by two customers at the time of this product review. Innova Rowing Machine offers a great intense cardiovascular workout, helps with increasing your heart rate and metabolism and burning calories and fat. So with the rowers it is not just about your back muscles but your whole body gets involved, including your core section and legs. Innova works with quiet magnetic resistance and you can adjust the level of magnetic tension resistance to eight different levels via the tension knob. You can enjoy great flexible workouts with varying levels of difficulty. There is a universal tablet holder offered as a bonus on this modern rower and you can use Galaxy, Amazon Kindle, iPad or other brand tablets comfortably. It has the large anti-slip pedals with foot straps to keep your feet in place and you can feel safe and stable during your workout. You’ll find the calories burned, time exercised, count and total count on the LCD-backlit digital display panel that lets you keep track of your workout progress. Innova IRM2000 weighs 71 pounds with a total user weight capacity of up to 300 pounds. You can fold it easily for easy relocation and storage in a convenient corner. It has a large and comfortable molded and padded seat that you can feel comfortable on over your long workouts and your long sessions will be more bearable. Innova Rower is a great fitness product to own if you don’t have a lot of time and money for a gym membership and you want to work out whenever you want. It runs very quietly and if you put this rower in front of the TV, you’ll be able to go for longer and burn more calories as you’ll be distracted and entertained. The handles are also nicely padded for your comfort during your session. Innova Rower combines resistance training and low-impact cardiovascular training (anaerobic and aerobic) for a leaner and toned body. You’ll benefit from energy bursts with every stroke in an intense rowing workout that causes zig-zag metabolism. Just like with any fitness equipment you may want to contact your health care provider if you have any relevant health conditions that may limit physical activities. It is shipped unassembled and you’ll find that it is not hard to put it together in less than half an hour with the instructions included in the box. You’ll get a warranty of one year by Innova Health and Fitness and you may contact their customer support team in case of any problems. But this brand new rower has a very robust construction- is a well built machine, just like the brand’s inversion tables that you may be familiar with. 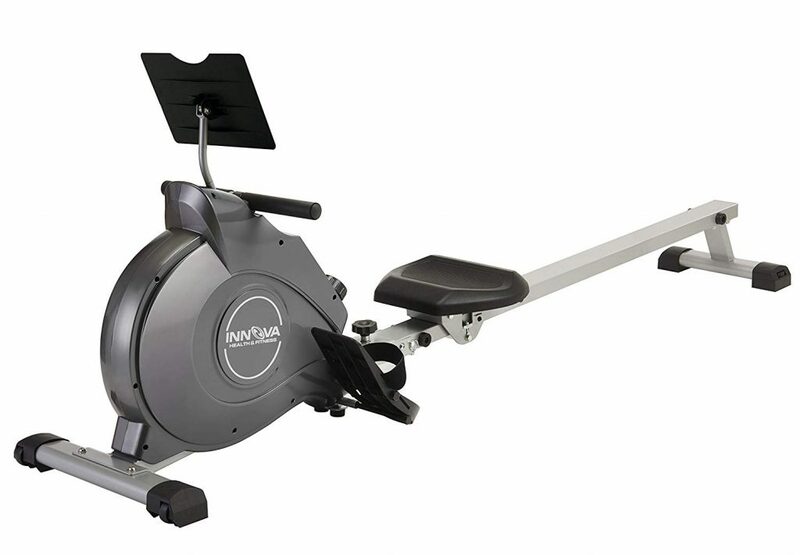 We do not hesitate to recommend the brand new Innova Rower, especially at the current price level at Amazon.com.